If the web is the university's digital front door, then a user-centered approach defines how we treat our guests. The UO-branded elements are designed to provide maximum utility for various audiences visiting UO websites while maintaining a consistent experience across sites. First and foremost, focus on your audiences and their primary needs. Then create your content to serve those needs. For example, you might focus on the services your unit provides instead of an organizational chart. In most cases, users visit your website in search of answers, and most often, those answers are more easily found when a website is structured around what you do rather than to whom you report. Leverage the strength of the University of Oregon’s reputation when building your site. Rather than attempting to create a branded identity for your department or a custom web design from scratch, use the resources on this site to provide your users with an effective website that is also within the established identity of the university. By using the existing UO branded website resources, you can focus your efforts primarily on your serving your audiences with excellent and usable web content. There are many ways to begin to focus on user experience. Browse through the pages in this section to learn more about our user-centered process or contact Marketing Communications to explore ways for us to assist you with your website. You can also start with Steve Krug's great book: Don't Make Me Think: A Common Sense Approach to Web Usability, which is available in UO Libraries. Why are they visiting your website? What are they trying to accomplish? How do their environment, attitudes, and prior experiences impact their expectations of your site? How do users refer to and think about your content? A deep understanding of your end users’ needs will enable you to make strategic, data-driven decisions about your website content, navigation, and design. What’s involved in our user-centered design process? Discovery – During the discovery phase, we seek to understand what both your end-users and your department requires for success. Information Architecture – This phase focuses on creating and testing effective and engaging content structure and site navigation to support user and departmental needs. 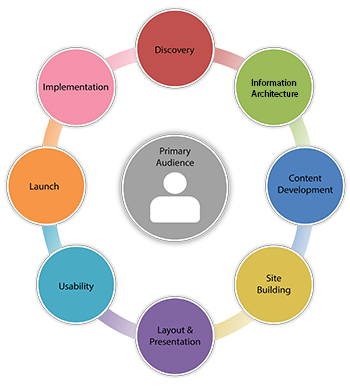 Content Development – With our guidance, you will develop content that supports your end-users needs and organizational objectives. Site Building – Staging sites are made available for your team to input and test content before launch. Layout & Presentation – We work with you to select templated design elements that support your content, messaging and user tasks. Usability – Iterative usability studies with end users helps identify last minute improvements to ensure that your site is effective, engaging and easy to use. Launch - Make your website live and make sure it's functioning properly. Implementation – After site launch, we assist you in validating usability and measuring outcomes.